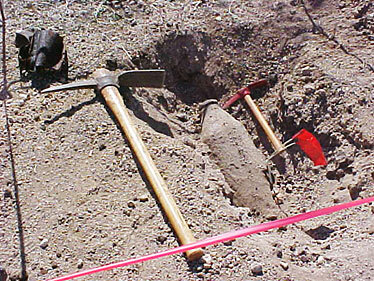 A 250-pound, World War II-era bomb was discovered in the dirt at the Makua Military Reservation. After it was found Nov. 1, the Army restricted access to the reservation. Draped in black and red instead of the traditional white for the Makahiki, native Hawaiian groups protested the Army's cancellation of the cultural celebration at the Makua Military Reservation. Malama Makua and Hui Malama O Makua held a protest vigil at the facility's gate yesterday, the first day of Makahiki. On Nov. 1, the Army discovered a 250-pound, World War II-era bomb near the gate to the live-fire training ground, and has denied access to native Hawaiian groups until it can detonate the device. The protesters called the Army's reasoning "double talk," saying that if the bomb was really a threat, it would've been removed or detonated by now, since the initial danger zone from the bomb extended beyond the fence and into water. "It doesn't make any sense for the Army to say it's too dangerous for us to go into Makua to practice our religion, and at the same time, refuse to remove a bomb it says threatens the lives of keiki playing at Makua Beach," said Momi Kamahele, cultural adviser for the group Makua Makahiki. "The Army's either lying about the danger, because it wants an excuse to deny us our cultural access, or it's being incredibly reckless with innocent people's lives." The Army is obligated by law to follow certain procedures and regulations before it can detonate the bomb, said Army Public Affairs Director Dennis Drake. "It's the goal of the Army to restore public access for the cultural events as fast as possible, within the guidelines imposed on us," Drake said. The Army just completed a sweep of the area looking for more unexploded ordnance. "The next step is to develop a disposal plan ... and that plan will be completed early (this) week," Drake said. "Then we have to comply with the National Historic Preservation Act, which requires a 30-day public comment period." Drake said the Army is trying to get an exemption from the federal government to shorten the comment period. Although the initial projected blast range extended past the shore, troops have placed sandbags that shorten the damage arc to within the fence line, he said. Makua has been an Army firing range since 1942. A 2001 settlement agreement to a lawsuit brought by Malama Makua allowed access to the area for cultural and religious celebrations. The groups yesterday draped the facility's gate in ti leaves and chanted. In early Hawaii, Makahiki was a festival time after the harvest when wars were put on hold, group organizers said. It is a traditional celebration of peacetime. Earthjustice attorney David Henkin, who represents Malama Makua, said it doesn't make sense to close off the area when the bomb has presented no threat for several years. "It has been there through years of live-fire training, literally making the ground shudder," Henkin said. "We feel comfortable coming here today because we believe there is no safety-based reason for the Army to preclude the cultural access that was to happen."